No palm oil in our soaps - Scrumpy Soap Co. There are many everyday products that contain palm oil and it has recently become the world’s most widely produced edible oil. Palm oil is a key ingredient in commercial soap (sometimes called vegetable oil). Australians consume an average of 10kg of Palm Oil per person each year. The reason palm oil is so popular is that it is cheap and plentiful. However, palm oil production is largely responsible for substantial and often irreversible damage to the natural environment, particularly in countries like Malaysia, Papua New Guinea and Indonesia who are major exporters of palm oil. The result of deforestation has resulted in a loss of habitat for many native animals including the Orangutan and the Sumatran Tiger. At Scrumpy Soap Co. we choose not to use palm oil for a number of reasons. * There is increasing world-wide demand for palm oil and plantations are being expanded to meet this demand. * The Palm oil industry is the single greatest threat to the survival of Orangutans and many other species by deforestation in Indonesia, Malaysia and Papua New Guinea. * Social conflict and human-rights’ abuses are commonly associated with palm oil expansion. * Uncontrolled burning is used to clear the land resulting in increased greenhouse gas emissions. * Lack of labeling means lack of choice. Palm oil needs to be listed as a key ingredient rather than using the generic term ‘vegetable oil’. 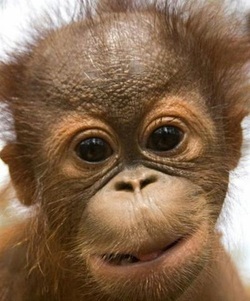 At Scrumpy Soap Co. we have adopted four Orangutans. We will continue to support other worthwhile environmental projects particularly those related to reducing our reliance on palm oil.